This is your Modern Bunk option. This option is your “inside” option with air conditioning. There are restrooms and showers located in each of the wings of the bunk options. The wings are all attached to the Main Lodge for yoga activities. 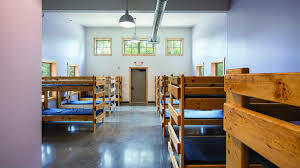 Each wing holds 20 people in bunk style beds. There is also a “living area” in each wing for social gathering.